With a late shift for work there was plenty of time for a snowshoe expedition, so Dee and I set out once again to tackle the snow. In contrast to our last outing, this time the temperatures were mild, the wind low and the sun was shining. Much nicer! We chose the Waterfall Trail, which started out along the ski trails then ventured off through a valley and eventually rose up the hillsides. 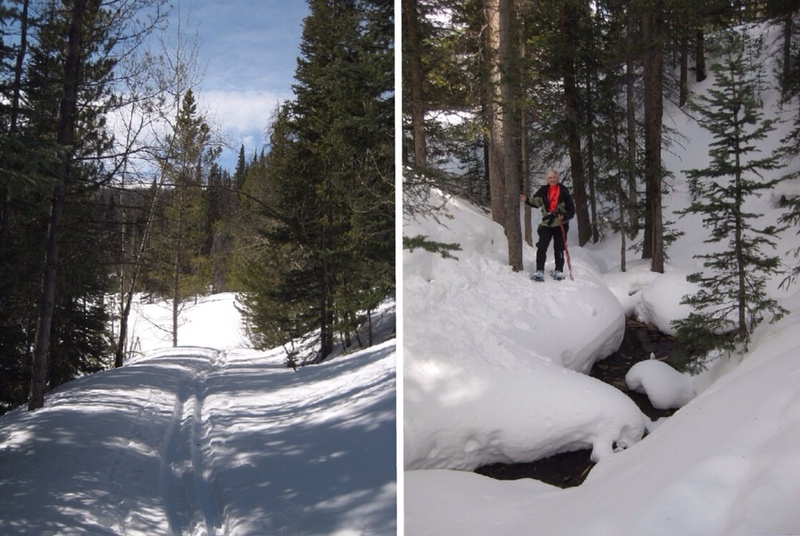 Some intrepid backcountry skiers had decided to ski the route, so it was easy to find our way alongside their tracks. With the sun beating down, we quickly shed layers, hats and gloves as we grew warm while trudging uphill. The blue sky made for a dramatic backdrop to the scenery, enhancing the experience. As we neared the waterfall, we could hear it trickling down. It wasn't a big opening in the snow, but the water was definitely flowing. 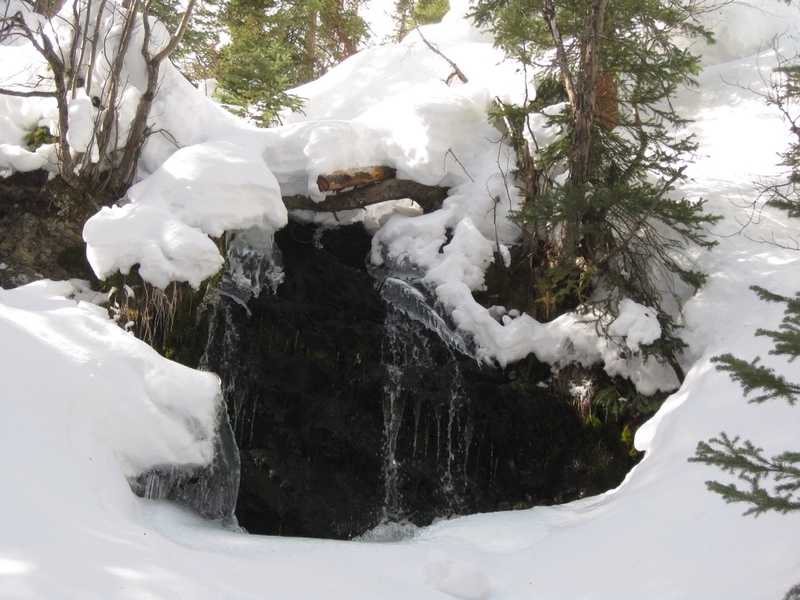 It left icy formations around the edges of the snowy hole and a pleasant sound in the otherwise silent forest. Although the clouds began to gather and eventually the sky became completely overcast, we decided to extend our walk to do the Coyote Tooth trail. That one had not been used since the last snowfall, so we were relieved to find that it was very clearly marked. We did a lot of climbing, but whenever we reached openings in the trees we were rewarded by expansive views. It was fun to see the ski trails on the opposite hillside, as if on a map in front of us. Eventually we were able to see out over the whole valley. Had it not been snowing in the distance, the mountain views would have been stunning. Our final descent was a series of switchbacks to make our way back down the steep hillside. The actual distance we had covered was disappointingly small, but it didn't come close to measuring the amount of effort we'd expended tromping around in the snow all morning. It felt good to see the car in the distance and complete our trek. Another successful snowshoeing adventure under our belts. 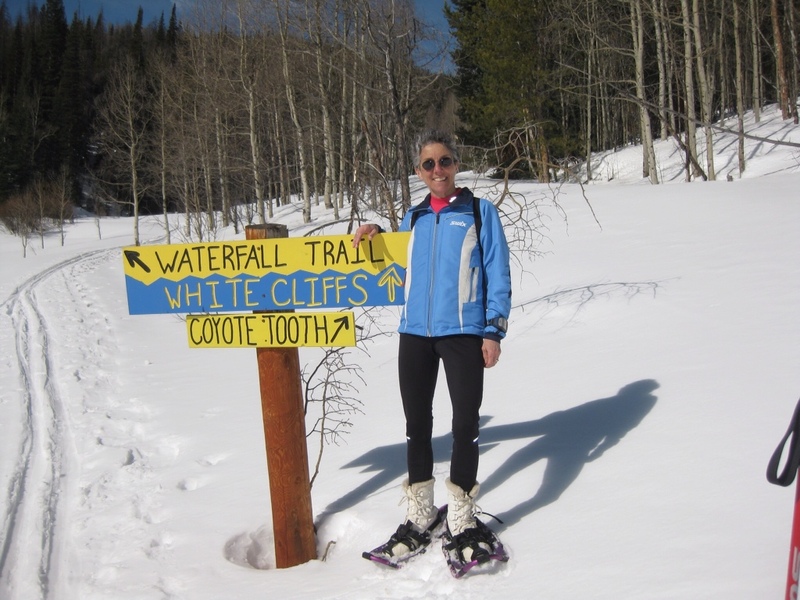 This entry was posted in Outdoors, Travel and tagged Outdoors, Rocky Mountains, Snow, Snow Mountain Ranch, Travel by Molly. Bookmark the permalink.